One of our favorite breakfast dishes is homemade yogurt with fresh fruit and granola. I first had this at a B&B in Chattanooga TN many years ago. 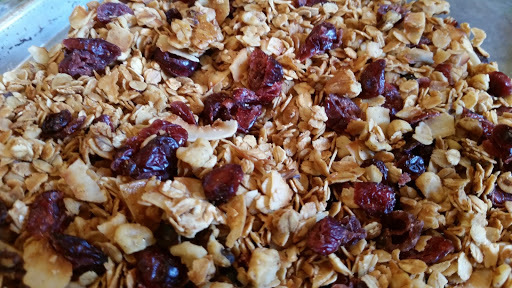 Granola is so easy to make, inexpensive, and you know what is in it…win, win! In a large bowl, thoroughly combine all the ingredients except the dried fruit. Place a sheet of parchment paper on a baking sheet and spread the mixture evenly on the pan. Bake at 250 degrees for 1 hour 20 minutes, stirring every 20 minutes to prevent burning. Keep an eye on it…it can burn quickly. Remove from the oven and let cool. Mix in the dried fruit and store in an airtight container. This will keep for 2-3 weeks. The beauty of this is that you can’t mess it up unless you burn it. Adjust the ingredients to your liking. Add more or less of any of the ingredients to your taste. You can even use a combination of coconut oil and butter if you prefer. If you don’t like it crisp, cook it a lesser amount of time. More crisp? Cook longer. Experiment with it and let me know what your favorite is. Our kids loved this as a cereal with milk. The mister loves to grab a handful as a snack.